September 21st to October 6th 2019. Guide to the world's biggest folk festival - the Wiesn! On the 12th of October 1810 Crown Prince Ludwig of Bavaria married Princess Therese von Sachsen-Hildburghausen. That wedding party was 209 years ago, & is still going strong today! 2019 will bring us Oktoberfest number 186 (it has been cancelled a few times over the last 200 years). The festival takes place on the Theresienwiese, “Therese's Meadow” - named after the Princess, normaly shortened to just the Wiesn. Today Oktoberfest is known as the largest Volksfest (folk festival) in the world! Last year 6.3 million people drunk 7.5 million litres of beer on the Wiesn; eating 124 Oxen & half a million Chickens; but found at the site last year were 2 wedding rings, 300 keys, 350 smartphones, 460 wallets, 280 purses, 840 passports & ID cards, a laptop, golden ballerina shoes & a dog leash! So please look after your things! The festivities start at 12pm on Saturday 21st of September when the Mayor of Munich will open the festival with the tapping of the first barrel in the Schottenhamel-Festhalle, with the words O'zapft is - "it's tapped." 1. Trachten! Munich is full of shops selling Lederhosen & Dirndls. For better quality clothing try Neuhauserstraße & Tal Straße. For lower quality try the shops around the HBF. Ladies: Where you tie the bow is vital! front-right and you are married, front-left and you are single and up for conversation, behind the back for a widow :-( and directly in the middle at the front for a desperate virgin!!! 2. This year all backpacks & bags bigger than 3 litres are prohibited & there are ID checks & luggage inspections for smaller bags. 3. Getting to the Wiesn! Theresienwiese or Goetheplatz Ubahn stations, Hackerbrücke SBahn or a 10-15 minute walk from the Hauptbahnhof. 5. The earlier you get there the better. If you can’t find a seat either bribe drinkers with a Maß to fit on the end of their table, or try one of the Biergartens around the outside of each Bierzelt. Food is served in both. Halbe Hendl (half a Chicken) served with Kartoffelsalat (Potato Salad) goes great with a Maß. Alternatively the Hofbräu-Festzelt does have some standing tables. 6. When the dancing starts, NEVER dance on the tables, only on the benches. Learn the actions to the Fliegerlied (check it on YouTube) & absolutely learn the lyrics to the song “Ein Prosit” as the bands in the tents play it every 20 minutes! 7. The Oktoberfestbier is only served in a Maß - a 1 litre glass - & is a little stronger than normal at around 6%. Know your limitations! 8. Enjoy the Gemütlichkeit! This word doesn’t really exist in English... It’s kind of the feeling of warmth & belonging, social acceptance & leaving your worries & troubles outside. You & your friends, together with a Maß in your hand. Prost! 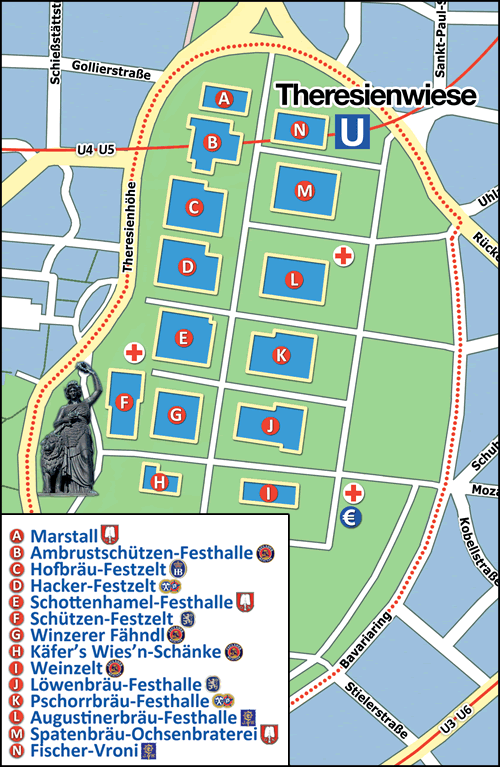 Saturday 21st September 10:45am - Arrival of the tent patrons with parade through Munich. Saturday 21std September 12pm - Tapping of the first barrel by the Munich Mayor in the Schottenhamel Tent. Sunday 22nd September 10am - Tradition costume parade through the city. Tuesday 24th September 12pm to 7pm - Family day 1! All rides and performances cost less. Thursday 26th September 10am - Traditional religious Oktoberfest mass. Sunday 29th September 11am - Concert of the Oktoberfest brass-bands at the feet of the Bavaria. Tuesday 1st October 12pm to 7pm - Family day 2! All rides and performances cost less. Sunday 6th October 12pm - Gun salute on the steps of the Bavaria monument.